Positive signs for sustainability and investors in this third quarter, not only in Europe but at global level, mark a convergence of interests which highlights the seriousness of the debate around sustainability and ESG issues in today’s economy. At an international level, there are clear indications of a marked interest in ESG investments. As Japan’s Government Pension Investment Fund (GPIF), worth Euro 1.04 trillion, decided to establish a new forum by the end of the year to accelerate progress on ESG, they look for an ESG index to try and maximise L-T investment returns through minimising externalities related to environmental and social issues. CalPERS, already a member of this forum, is taking a renewed commitment to sustainability with a new five-year ESG strategic plan. The pension fund says the plan is the next stage of evolution of CalPERS’ work on sustainable investing, focusing on: reporting standards & transparency, engagement and research. Positive news also came from China, where the G20 included ‘green finance’ as one of its major policy themes for the first time, ahead of the G20 Leaders Summit in September. This was a major shift which means that it will lead to policy in G20 member states. The G20 was very decisive in crystallising the commitment of the Paris Agreement on Climate Change and bring them into force as soon as possible. As the debate around corporate reporting in Europe intensifies, and the European Commission finalises its work around the guidelines for non-financial reporting, across the Atlantic, the Securities and Exchange Commission (SEC) is increasingly aware that the information companies are reporting on as part of their SEC filings, are falling short of investor’s expectations. As US law requires public companies to tell shareholders of substantial events that relate to their business, such as lawsuits, financial performance and overall business trends, the Commission has noticed that certain relevant information that allows shareholders to get the full picture of how companies are managing the threat of climate change were missing and is therefore considering changing the rules on environmental disclosure. In September, green bonds remained at the top of everyone’s agendas, as the EIB (the European Investment Bank) decided to submit its comprehensive statement (CAB) describing, in detail, its Green Bond activities in 2015 to a third party audit and get an Independent Reasonable Assurance Report issued by KPMG Luxemburg. This move will lead to a higher degree of assurance and standardisation (as part of limited assurance) which adds further substance to the green bond market, while offering enhanced reliability to the information provided by the EIB, in full support of the Green Bond Principles of the International Capital Market Association (ICMA). This step marks the EIB’s intention to take transparency, one step further, on the path to standardisation for green bonds. More transparency is demanded from companies and investors even in Switzerland, as the nation’s Federal Office of the Environment launched a public consultation in October, inviting stakeholders to express their view on how to help investors “actually assess the CO2 relevance of assets”. Although Switzerland already has a levy on C02 emissions, and an independent emissions trading scheme that could potentially link up to the EU Emissions Trading System, the country intends to undergo a total revision of its CO2 legislation, in order to be able to implement the conditions of the Paris climate agreement. The European Commission is preparing to develop its strategy on Sustainable Finance and in view of that is going to set up an Expert Group made of specialists that can help shape the objectives and targets for a sustainable Europe. Eurosif looks favourably at this initiative and following from the European Union ratification of the Paris Agreement, eagerly awaits discussions around the start of implementation of the Paris Agreement, at COP 22. Against this backdrop, Eurosif is putting the finishing touches on the 2016 edition of the SRI Study, which has been prepared in collaboration with all the SIFs and which will be launched in Brussels on the 10th of November. 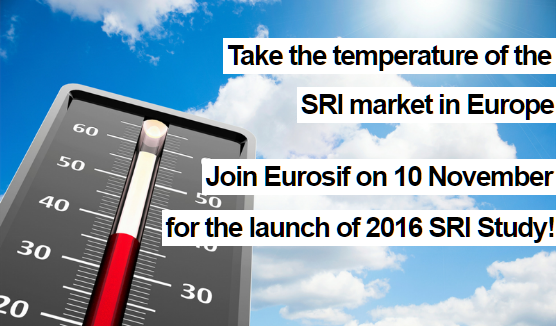 We’re launching the 7th edition of our seminal SRI Study in Brussels on the 10th of November. Unique in its kind, the Eurosif Sustainable and Responsible Investment (SRI) Study is the benchmark report on the European SRI market. The study is one of the few sources detailing the European SRI market. Findings from the SRI studies are regularly quoted and used in research papers, in various forums and international bodies, as well as by Eurosif member affiliates. The media regularly quote the results of the SRI studies. Thought leaders from asset owners and managers, pension funds, European institutions and companies alike regularly refer to the findings. On the 4th of October, the European Parliament has approved the ratification of the Paris Agreement by the European Union. Eurosif welcomed the news, as we consider this landmark agreement could make a key difference in the climate change debate on both a European and national level. 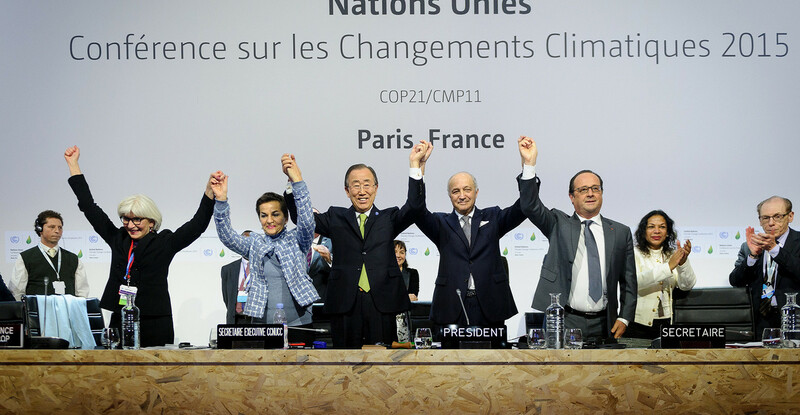 As the ratification was approved by the EU parliament, the bloc of countries will not have to wait for each country to finalise the domestic approval procedures, meaning the Paris Agreement should enter into force just in time for COP22! Last month, the European Parliament voted in favour of rejecting the PRIIPs proposed regulatory technical standards (RTS). This came after the ECON Committee voiced concerns that “they might not achieve the aim of providing accurate, accessible and comparable information“. Shortly after, he S&D Group sent out a press release, in which MEP Pervenche Berès declared that she “will do everything possible to reach an agreement on PRIIPs, because such information is critical in the current environment”. Eurosif supports MEP Berès and her willingness to obtain a strong and transparent PRIIPs. 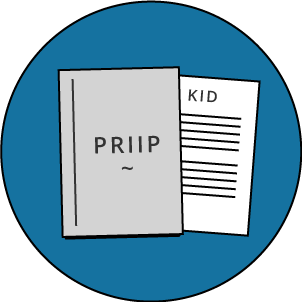 The European Commission must now propose a new RTS to implement PRIIPs, with a PRIIPs implementation expected for year end. The fifth edition of the Italian SRI Week includes ten events that are going to be held in Milan and Rome. The main topics to be discussed are climate change, impact investing, the importance of environmental, social and governance (ESG) issues for Italian Foundations, financial education, engagement on children’s rights. Once again this year a full program of cultural events (concerts, theatrical performances and workshops in schools) are going to be held alongside the conferences, in order to involve a wider audience into the issues related to sustainable finance. Finance and sustainability do affect all of us – says Francesco Bicciato, FFS’ Secretary General – That’s why it’s important to stimulate the public debate on this topic, so that more people can make informed choices and contribute to the environmental, social and economic transition that our society needs. For further info, visit the official website. French SIF just released this 40 pages’ workbook including interviews and testimonies from ministers Ségolène Royal and Michel Sapin, NGO leaders Pascal Canfin and Nicolas Hulot, and various experts of responsible finance. It focuses on the spirit of the law and gives an investors’ roadmap towards an ESG-Climate investment strategy and reporting. It will soon be available in English. To date, 16 funds of 4 asset managers (Amundi, BNP Paribas IP, Fédéral Finance, La Financière Responsable,) have been audited by Afnor Certification or EY France and obtained the SRI label. More than 50 funds are expected to receive it by the end of the year. 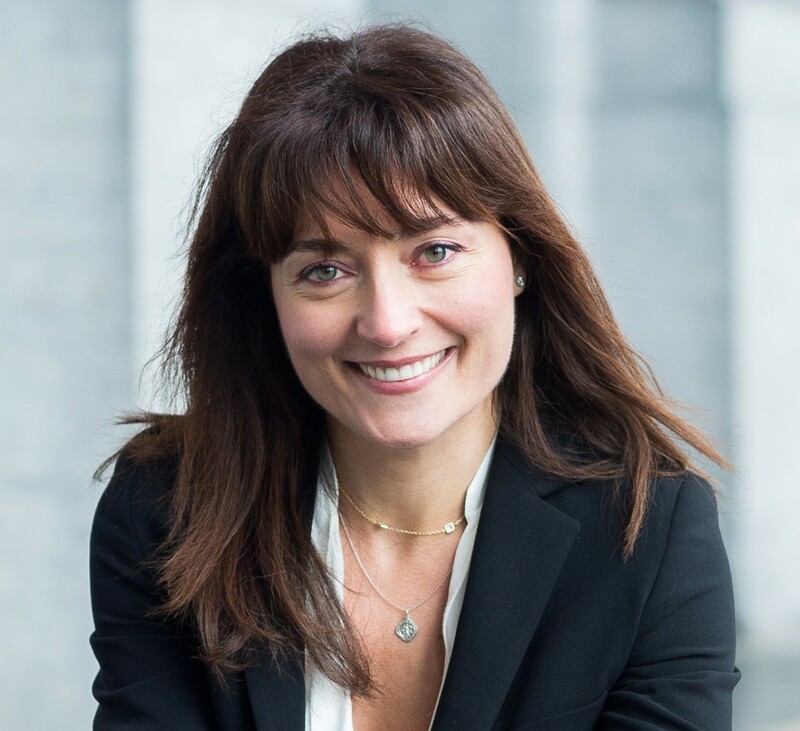 Nicole Notat, CEO of Vigeo Eiris has been nominated by Michel Sapin, Finance Minister to chair the label committee. This committee will have the important role of reviewing the label guideline in the following years. HGA Obligation vertes a green bonds fund of Humanis Gestion d’Actifs recently obtained the Climate Label (which auditors are EY France and Novethic). Acofi Gestion, Demeter Partners, Mirova, RGreen Invest and Sycomore AM have obtained labels before summer and assets under management reach now one billion euros. It is with great sadness that we have learned of the passing of Eric Loiselet at the age of 56. Eric was a director of the FIR and one of its co-founders in 2001. Until recently, he was one of the strongest advocators for Article 173 of Law Energy Transition to Green Growth; an article whose pioneering nature and ambitions are now internationally recognised. Eric will be remember for his charisma and good nature. 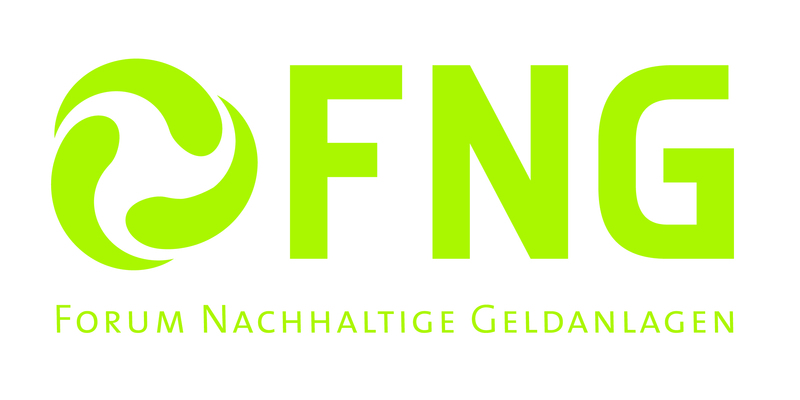 FNG and its subsidiary GNG will announce the funds awarded with the FNG Label 2017 in Berlin on 23 December 2016. The certification proofs that the respective mutual fund meets the standard for sustainable investment in German speaking countries. The label auditor is Novethic. An award for exceptional performance is given to funds which are distinguished by a particularly consistent and rigorous sustainability strategy in relation to product standards, institutional credibility, selection and the exertion of direct influence on companies. The applicants may be awarded a maximum of three stars here. The event takes place at Deutsche Kinemathek – Museum für Film und Fernsehen, Potsdamer Str. 2 in 10785 Berlin on 23 November 2016 from 10am to 4pm. Please find the program of the event here. For registration, please send an email to fng-siegel@g-ng.eu. From the 21st to 25th of November 2016, the Dutch SRI Week will be taking place. 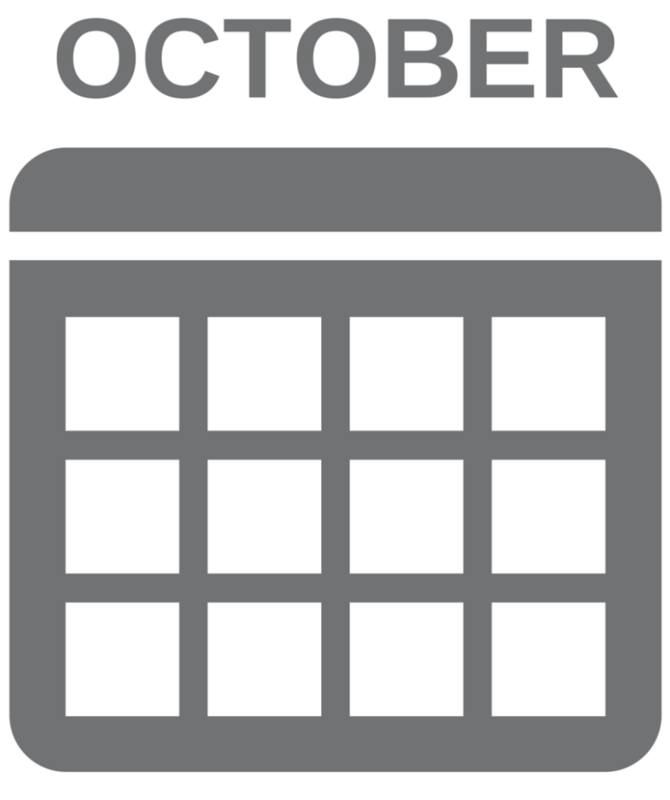 Furthermore, VBDO will publish its ‘Tax Transparency Benchmark 2016’ on 31 October. 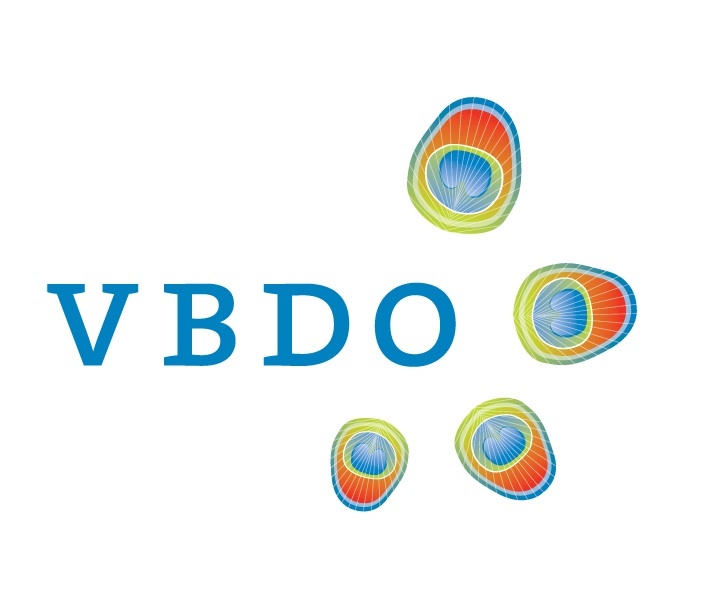 A few weeks later, the VBDO will publish the ‘Benchmark Sustainable Investing by Dutch Pension Funds’. For more information about upcoming events and reports, please visit the VBDO website. Spainsif is gearing up for the 7th edition of the Spain SRI Annual Event on the 18th of October, sponsored by Cecabank (principal sponsor), Vdos, Nordea and Morningstar. This year, we will welcome Mr. Eric Usher, Head of United Nations Environment Programme Finance Initiative (UNEP FI) as well as several key administration representatives (Spanish Economic and Social Council, National Stock Market Commission, Ministry of Economy and Ministry of Employment and Social Security). Furthermore, this year we have three consecutive workshops tackling current issues such as Sustainable management tools, ESG in real assets and taxation in the SRI. Speakers will include representatives of main SRI asset managers, asset owners and advisers firms in Spain. The attendance is free! For the full programme, please click here and to register, please click here. The Spanish Financial Education Plan, to which Spainsif is a contributor and whose promoters are the Spanish National Stock Market Commission and the Banco de España, held its second financial education day. On this day, promoters and contributors presents their indicatives in financial education. To find out more about the day, please click here. Spainsif and the Ministry of Employment and Social Security laid the groundwork for action within the agreement. Meanwhile, the Ministry has included a section about SRI on its website, linking to the Spainsif website. For more information on the Spanish SRI market, subscribe to the Spainsif newsletter! A lot has happened since the ESG Profile (“Hållbarhetsprofilen”) was first developed by Swesif together with its member companies in 2013. In May 2015 Swesif launched the ESG profile on the private market in Sweden. After one and a half years, 47 fund companies have already joined and today more than 700 funds are reporting their sustainability efforts on www.hallbarhetsprofilen.se. In addition, the ESG Profile is distributed to seven fund platforms. In 2015 Swesif initiated a project to further develop the ESG Profile together with its member companies. The aim was to create a clearer structure and transparency in order to raise awareness among savers and improve the ability to compare different funds. The work is now done and in January 2017, the new version of the ESG Profile will be launched. In connection with the launch, Swesif is implementing a few changes. A new technical platform has been procured in order to build the new version with greater functionality. Furthermore, the change will mean that licensing costs are lowered considerably for the fund companies. Find more information about the ESG Profile here. UKSIF is currently working flat out on Good Money Week (30th October-5th November), our annual campaign that promotes responsible finance to the general public. It kicks off with an event in London on 24th October to launch materials and a new animation we have had produced. That event will feature panels between millennials and finance since our opinion polling (also being launched in GMW) continues to show that millennials have desires different to those of the wider market. We will also hear a short address from Rob Wilson MP, the minister for civil society who is responsible for the Government’s new Inclusive Economy Unit that will develop policy on social investment and responsible business.Beyond GMW, we are drafting a letter to a Parliamentary Committee which is responding to the new Prime Minister’s interest in corporate governance. Eurosif was invited to attend the World Forum for a Responsible Economy in Lille on the 10th of October to discuss and launch proposals to accelerate CSR integration in the world economy. This 10th edition of the World Forum focused on an economic, but also social responsibility: what is the role of companies? How far can it go? Are companies being asked too much? Or could more be expected from them?For an overview of the forum and for more information, please click here. On Friday the 21st of October, a high-level day of discussions was jointly coordinated by DIE, BDI and UNFSS to mark the launch of the 2nd UNFSS Flagship Report. This second edition seeks to dissect the interplay between VSS and public governance processes by striving to answer the following question: What are the optimal dynamics between public policy processes and voluntary sustainability standards to ensure sustainability objectives are most effectively met? It can be downloaded here.Eurosif explored the relevance of SRI and international standards on a panel with DEG’s Katharina Hermann, BMZ’s Anja Wagner, ICTSD’s Dr S. Wallace Change and FNG’s Ms. Gesa Vogele. 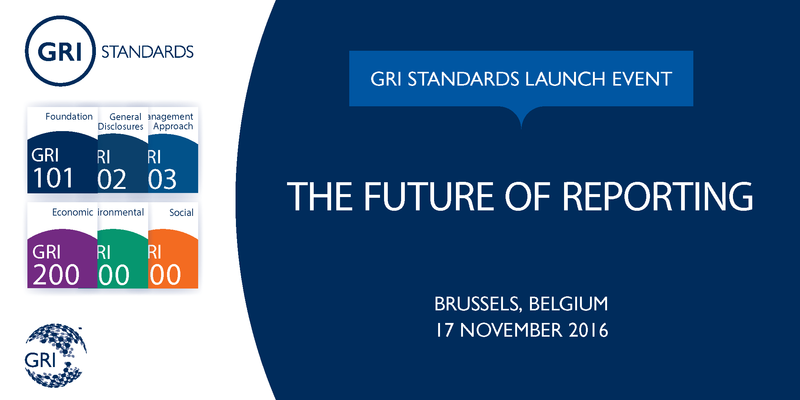 Between October 2016 and May 2017, GRI will be hosting launch events around the world with experts guiding participants through the benefits of the new GRI Standards, offering an excellent oversight on the changes from current version, the GRI G4 Guidelines. Launching on Monday 28 November 2016 in Brussels, Belgium, Invest Week aims to support the European institutions in delivering an Investment Plan for Europe, by providing a forum for the investment industry, public investment agencies, corporate investors, entrepreneurs and employee organisations to meet with policymakers and explore a positive agenda focused on Europe’s economic future. Eurosif is a partner of Invest Week.Invest Week will provide a major platform for attracting investors and investment bodies from outside of Europe, promoting the strength of the world’s largest economic area as an investment destination. For more information, please visit the Invest Week website. Copyright © *|2016|* *|Eurosif- The European Sustainable Investment Forum|*, All rights reserved.